Fifteen miles west of Kuala Lumpur sits the quintessential upper middle class Malaysian suburb of Kota Kemuning, Shah Alam. There are acres of private club houses, newly-built malls, public schools and Wet World Waterpark. Dry, quiet and remote, these thoughts came to mind when I first visited the area. But what seems to be monotonous life in Kota Kemuning could very well be its best offering, for many of the residents here prefer a quiet suburban life to a hectic existence in the city. Or at least that is the case of Felicia Hoo. For Felicia, Kota Kemuning offers an unmatched convenience for her family, her business and herself. The jovial woman is the CEO of Samaria Sdn Bhd by day, a single mother by fate and an artist by choice. 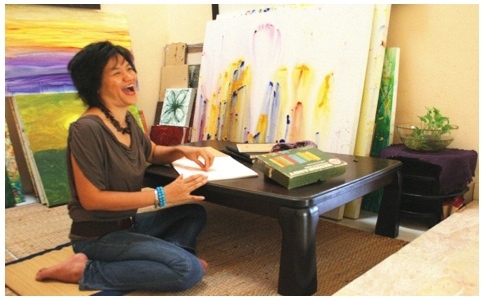 She runs a multi-million dollar worth of cutlery business, sends her two boys to school and takes time to paint from her mini studio – all of which are done within Kota Kemuning. Although Kota Kemuning is far from the city centre, Felicia maintains that the area is by no means a secluded one. Thanks to the well linked major expressways such as the North-South Central Link, Federal Highway, Damansara-Puchong expressway and the proposed Kemuning-Federal Highway link. “It is just the best location for me and my family,” Felicia comments proudly of her area. Stepping into Felicia’s 2-storey bungalow feels like a trip down the memory lane. There is an arresting nostalgic appeal that is usually present in your grandparents’ house; the kind of old house charm that instantly makes you feel at ease. Part of it could be due to a Singer sewing machine and an old stereo that are perched in one corner of the living room, while the other could be because of the old-fashioned arrangement of the furniture, the simple selection of fabric for the curtain and the natural greeneries the house is surrounded by. Whatever it is, it is hard to resist the allure of this house. Yet, from the outside, it is a mere modern bungalow with an extensive garden, a spacious living room and a lot of canvasses propped against the walls. Such contrast makes this house, well, charming. The first floor consists of two living rooms, a kitchen and a guest room that is converted into a mediation room. Three bedrooms on the second floor are occupied by Felicia and her two sons. “People always say that my house has an air of an art gallery,” says Felicia of her cosy house. Which is understandable; there are at least sixty canvassed paintings scattered around the house, all of which are done by the lady herself. The well-ventilated house has two big doors that allow fresh air and sunlight to come into the house. Felicia asserts that she does not feel the need to decorate her house with fancy stuff. What she looks for in a house, according to her, is comfort. “A house that provides you with a peace of mind is priceless. Your home is worth millions when it houses your heart,” she says. How true! Felicia Hoo is not the typical CEO with a power suit, two assistants and three mobile phones. She is, indeed, more of a jeans-and-funky-hairstyle kind of CEO. As if that is not rare enough, Felicia is also a soon-to-be Transcendental Meditation (TM) instructor, an avid traveller and an occasional host in household product exhibitions. Yes, she does all these while having her cutlery business rolling. Of her occasional hosting gigs, Felicia comments, “I had been given chances to do a 45-minute food carving demo to visitors during exhibitions like HomeDec.” She does not consider such shows as merely a part of marketing strategy, but also a chance to bond with her customers. Ever an advocate for green cause, Felicia is set to educate her customers about this issue. She has started this effort by utilising 100 percent non-toxic materials for the production of Samaria products. It is not surprising, then, that her business only gets bigger by the day. She credits her house for her tremendous success. Which Feng Shui guru did she seek advice from, you may ask! “I never had any Feng Shui advice from anyone,” she says. “What we all need is a place where we belong. I can go into a state of total absence from stress and anxiety from work when I paint here,” she says, pointing at one corner in the kitchen, where a cloth-coated wooden table, a few chairs and a fan are placed modestly. “I sketch faces, emotions and natural beauty here. When I get a solid idea, I spill it onto a canvas and start painting at my mini studio,” says Felicia. Her abstract arts are quite impressive, especially considering the fact that she has never been trained professionally. The moral of the story is: to make your home a comfortable space for your mind, body and soul is to write your own success story both in personal and professional life. Just ask Felicia! After Willy Wilson, the student who wrote this article, thanked Dr. Mohan for the class, Mohan replied that it had been a pleasure for him as well, and that Felicia was going to Thailand to train as a TM teacher very soon. The end of the article mentions that she will have her “first solo exhibition in Iowa, United States, next year. The art gallery and I are firming things up now,” she says. A good guess would have it in one of Fairfield’s more prominent art galleries. More to come…. This entry was posted on November 29, 2009 at 5:21 pm and is filed under Art, Articles. You can follow any responses to this entry through the RSS 2.0 feed. You can leave a response, or trackback from your own site.